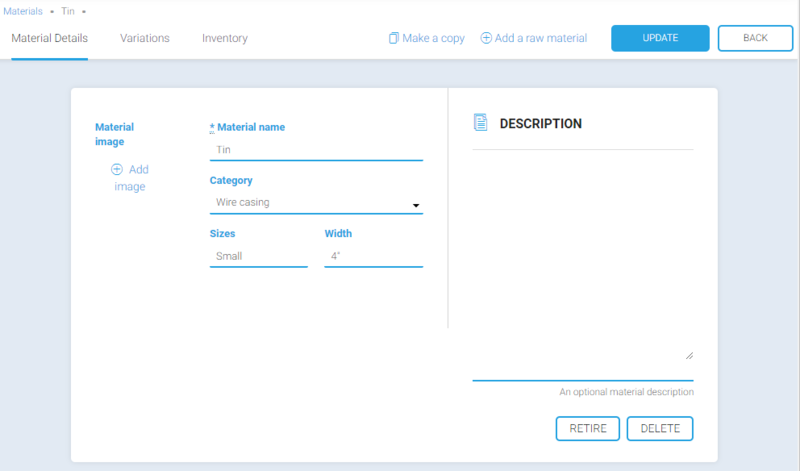 Stitchex lets you to specify the raw materials components of your products and then calculate and export your total materials requirement to cover sales (customer orders) or production (manufacturing). Before specifying components of products, you'll need to add some materials to your materials database. Select Raw Materials from your left main vertical menu. 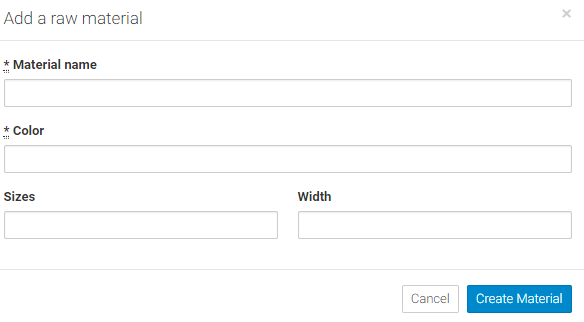 Type the name of your material in the Material name field. Type the Color of your material in the Color field. Next you will want to specify the details of your material. Add an image by clicking on the plus sign. 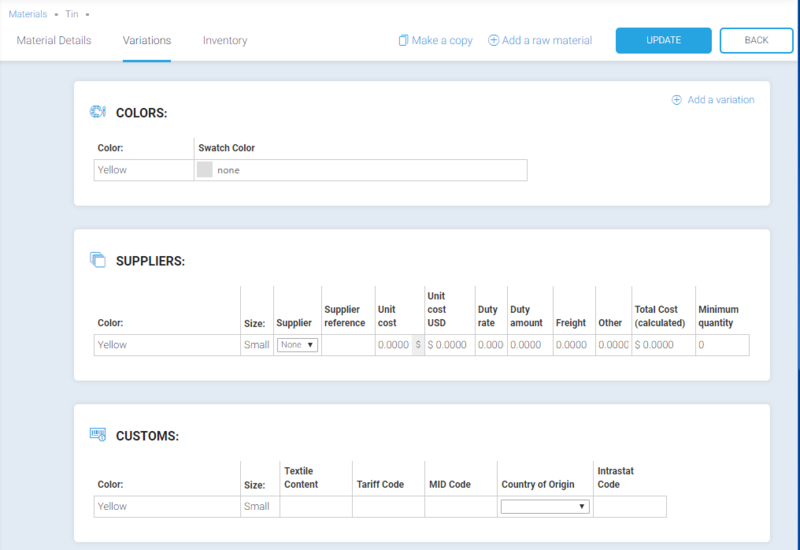 Next you will want to specify the colors (if applicable), suppliers (optional) and customs information on the Variations tab. Select your color from the graphics -- or if it is not present, you can manually type the hex code in the blank field to the right. To add additional colors, select the + plus sign Add a variation on the top right. Once all your colors are added, click Save. See also our Product Swatch Images and Standard Colors Knowledge Article for additional information. Be sure to specify the per unit pricing in the supplier's currency. Specify the exchange rate to use for costing. And, add a supplier reference code. Supplier details are stored alongside customer and manufacturer details in your companies database. See our Knowledge Articles on adding Manufacturers. Navigate to the Raw Materials page. Click the Material's Details Tab. Click the "Retired" button as shown in Figure 2 above. Click the "Update Material" button to save your changes. Please note that you cannot delete a material that is in use as a product component. To hide such a material you should edit the material details and set it as "retired". Navigate to the relevant material details page. Updates made to your material database will filter through to your product total costings. For example, updating a material unit price will update the unit price for that material on all products and variations referring to that material. Similarly, when you update a supplier currency, the currency on the materials referring to that supplier will update. You should note that the exchange rate set on the materials will not automatically update. For example, if you update a supplier currency from EUR to USD and your home currency is set to GBP, you will need to go through your active materials for that supplier and reset the exchange rates to the desired value(s).